Summer is almost here - for real. I think I can basically taste it. And I'm not the only person in my family who is jumping for joy when it comes to the sounds of summer. My family lives and breathes the season and everything that comes along with it. We play hard all day and at night, we all sleep hard. That's one of the best things about summer. But overall everything I truly enjoy these little moments that are made together as a family - the ones that make our days memorable and our hearts full. This past weekend we got a taste of what is about to come with warm temperatures and sunny skies. While I had anticipated an extra hour or two of sleep that Saturday, Lola woke me up bright and early ready for breakfast. So instead of waking up everyone else, the two of us tiptoed off downstairs. Together we snuggled up on the couch under a blanket, Lola with her milk and me with my trusty coffee cup enjoying our morning dose of cartoons. I love the feeling of knowing there is nowhere to go and not a rush to get moving along - and in that moment, I was quickly reminded of how much I enjoy our summer mornings like this one together. Sometimes it feels like we are constantly on the go everywhere we go. But in this small moment I started to get excited about being able to turn off the alarm clock and let these sweet little faces be my alarm for the next two months. 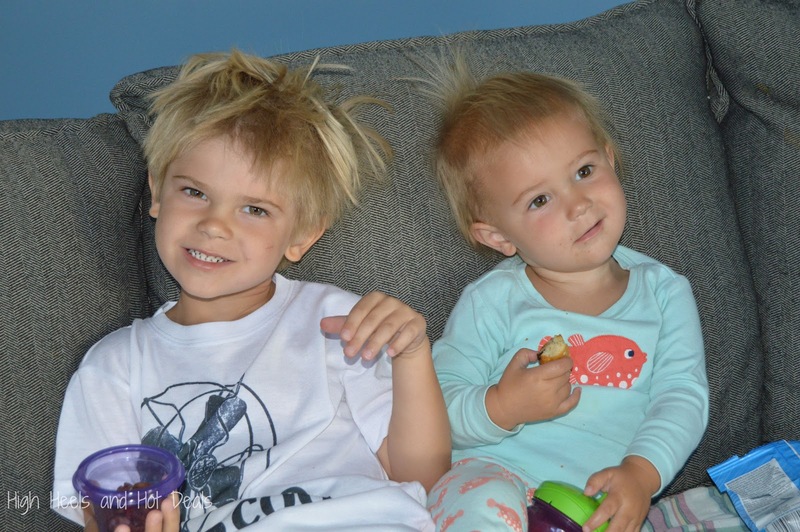 From the precious little bedhead to the darling smiles on their faces - I could eat each one of them up over and over again. I laughed at the muffins in Lola's hand because I realized how often we eat Entenmann’s® Little Bites® as part of our breakfast routine. During my last weekly grocery run I grabbed a box of Entenmann’s® Little Bites® Smurf Blueberry Muffins (only available until April 30th!) because a day doesn't go by when either of Cohen or Lola asks to see, "Smurfs, The Lost Village" since it hit theaters April 7th. (When you purchase two specially marked boxes you receive a $5 off movie ticket to see the movie!) Plus Entenmann’s® Little Bites® contain no high-fructose corn syrup, no trans-fat and are certified Kosher. The little bags are perfect for morning bites or afternoon snacks and just 200 calories a pack. My kids loved these things since they were little! I definitely plan to stock up for our summer of fun. As I left my classroom tonight I glanced at the calendar and counted just 27 school days left until summer break. I'm ready for fun in the sun and lots of time with my littles! What are your favorite little moments with your family? For more information about Entenmann’s® Little Bites® Smurf Blueberry Muffins or about the Fandango Movie Promotion, please visit www.littlebites.com. Spring is FINALLY here. While it may be snowing (yes, SNOWING) here in Indiana today, the forecast is sunny skies and 70 degrees this weekend. (Indiana weather is a hot mess people.) While I love nothing more than the breeze through an open window, it is an even better combination when paired with a fresh and clean house. My husband recently replaced our carpet with wood floors and as a mom of three littles and a wild dog, I love that it makes cleaning up easier. However, my kids refuse to wear shoes when the weather is warm so I find myself mopping and cleaning up little piggy toe marks off the floor several times a week. But when it comes to cleaners, I like to do a my research a bit. I prefer to find ones that aren't loaded with harmful chemicals but can still give my house a mean clean. After the hard work my husband put into these floors, he too can agree that he prefers a cleaner that provides an effective clean for our hardwoods but one that is gentle without added dyes or scents. 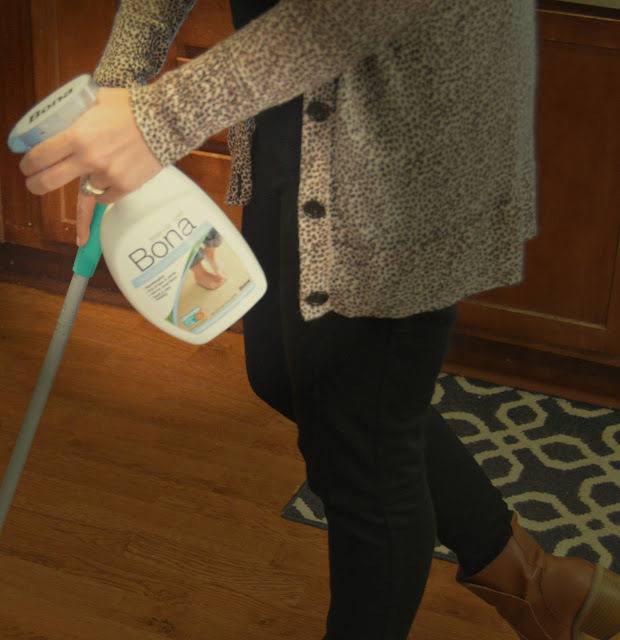 Bona free & simple is a water based formula that is hypoallergenic - which means it is safe to use around my kiddos and pets. Plus it removes over 93.3% of allergens from hard surfaces and is certified allergy and asthma friendly by the AAFA, which is especially important for Cohen who has respiratory issues. Bona free & simple cleaner is simple to use. Just three steps actually! 1. Spray in the area you want to clean. I told you it was super easy! My floors look great and those little piggy marks are easily cleaned and wiped away! 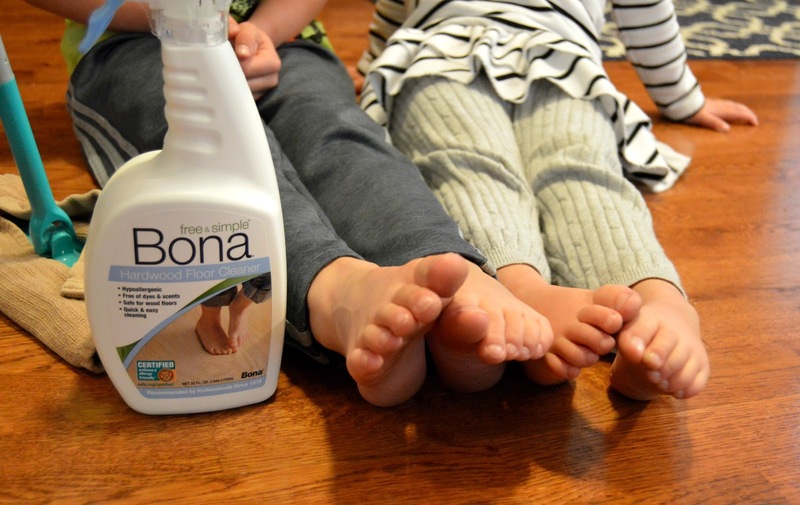 Now with three kiddos (and six feet) running around this house, Bona free & simple will help make cleaning up after my family so much easier. 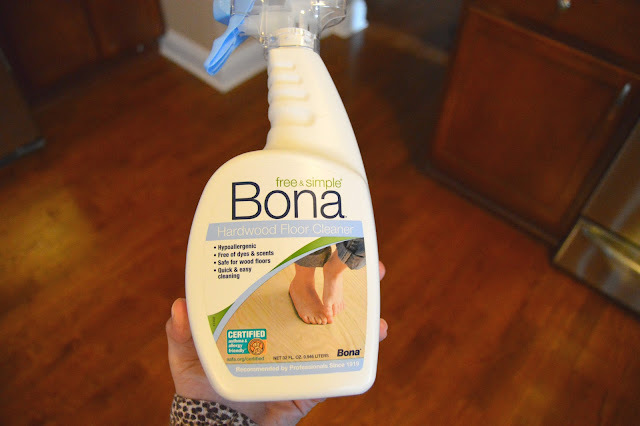 For more information and to find where you can find Bona free & simple near you, check out their website! Be sure to follow @mybonahome on Facebook for product news, offers and their upcoming sweepstakes! Disclosure: This information and giveaway has been provided to me by Store Brand Formula. All thoughts and opinions are my own. I'm a wife, a mom of three, a teacher of twenty-two second graders and I run not one, but two different sites. Plus I'm a lover of the treadmill and cycling classes. So ask me, how do I balance it all? I have to be honest...sometimes I don't. There aren't enough hours in a day to get everything done nor enough days in a week to get all of the boxes checked off on the to-do list. The thing is, I think even if I was given an extra day each week or an extra hour a day, things would still be left to do. Because life. That's why. Life happens. So I'm learning that it's okay to not get everything done. Of course it's been hard for me. I'm one that can't handle leaving with a desk full of papers or knowing I have emails that need to be checked. But I have also found that I have to let it go because I can't do it all - there's no way. And even though it's hard, I'm finding that my level of happiness only grows bigger. 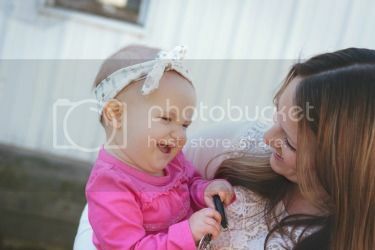 So what is my secret to parenthood happiness? I love being able to take Lola to ballet on Saturdays, just the two of us. I also love taking time at night to read with Cohen in his top bunk and listening to the stories about his day. Scooping a running Remy up from the babysitter everyday and hearing her raspy giggle is also one of the happiest moments of my day. I also love my solo runs on the treadmill in the early morning hours as I catch up on my DVR. It's about finding these little moments and not telling the hustle and bustle of the other busy things in my life get in the way. My formula of happiness is when I let things go for a bit and enjoy the moments that really warm my heart. Speaking of formula, with all three of my kids, when we switched to formula I quickly found out how expensive the name brands would add up each week. I wanted an alternative that was just as good as the name brands and wouldn't put such a harsh dent in the wallet. Store Brand Formula is nutritiously comparable to nationally advertised brand but costs up to 50% less! It's called formula for a reason, right? And now, Store Brand Formula wants to know what is YOUR secret formula to parenthood happiness? It could be worth $1,000 plus a year worth of store brand formula if you're lucky! 2. Use our Store Brand Formula emoji keyboard to create your personal formula for parenting happiness. Here's mine! 3. Confirm you are at least 18 years old at time of entry and agree to the contest official rules. If there is one thing I have learned in my six and a half years of parenthood, it's that it really goes by so fast. 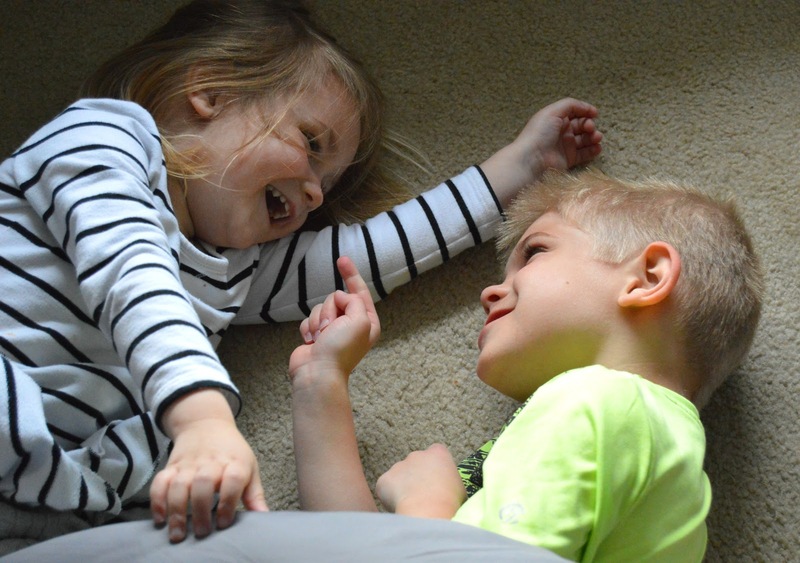 While there may not be enough time in my day to balance it all, I'm going to cherish these small moments with my littles for all that it's worth because that's what counts. Ferris Bueller said it best, "Life moves pretty fast. If you don't stop and look around once in a while, you could miss it." And he's so right. Share with me! How do you balance parenthood? Enter below for a $25 virtual gift card!